Central City Coffee was founded in 2013 as a social enterprise branch of Portland nonprofit Central City Concern. Their goals are to “transform the lives of homeless women through securing housing, providing services and network to improve lifestyles and maintain sobriety, and, finally, by providing training and volunteering opportunities for women to seek gainful employment, the final step to self-sufficiency.” Through its job training program, CCC helps its trainees learn valuable and transferable job skills through the coffee trade. Lisa Quinn is Sales & Marketing Representative at Central City Coffee, and a former trainee in the social enterprise program. Nossa Familia has been with CCC since the beginning, helping with evaluating, sourcing and roasting their coffee, as well as providing production space for packaging, order fulfillment, and running events. We have also featured their coffees in our cafés, and are proud to do so again. In March 2019, in honor of Women’s Month, we are happy to serve their “Punk Princess” blend at our Portland cafés. 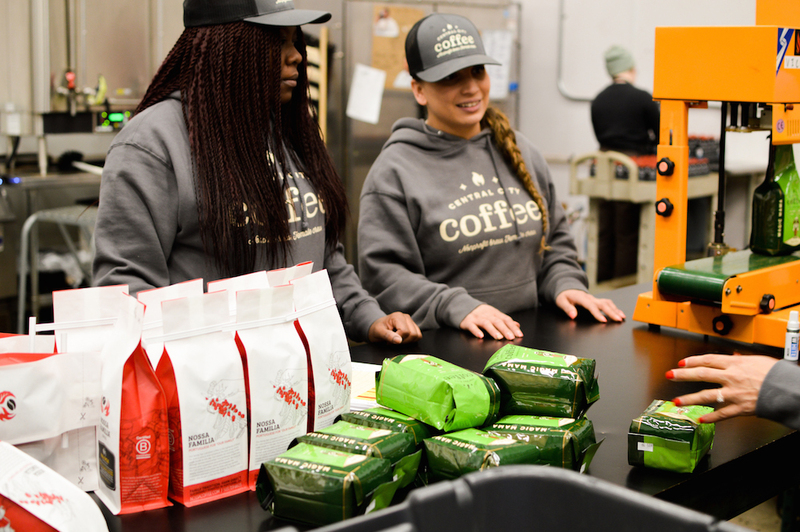 We sat down with Lisa Quinn, Sales & Marketing Representative, and Sarah Porter, Business Director for Central City Coffee, to learn more about the program. Can you tell me more about the mission of Central City Coffee? Lisa: Our mission is self-sufficiency for our trainees who are in recovery. We primarily work with single parents, and 99% are single moms. They are recovering addicts, and some are from Central City Concern’s transitional housing in early recovery, meaning they’ve been through less than 1 year of treatment. They are getting their kids back, learning how to work, juggle life, and be sober. What is Central City Coffee’s training program like? Lisa: Our training program is a 6-month program. The goal is for our trainees to get full time employment after 6 months. 4 months into the program, the trainees get 8 paid hours a week to do their job search. One of our trainees, Amber, is now a full time employee of Central City. She was promoted to clerical training supervisor around 6-8 months into the program. Andie, Amber and I were all there in the program. We had to overcome challenges and go through changes. Even good changes can be really stressful. I had a 6 year gap in work. It was a scary transition to become a trainee and go back to working. As a trainee, I had to figure out daycare, showing up on time to my shifts, and how to be both a good employee and a good parent at the same time. It was really stressful, but I learned a lot. What type of work do the trainees do? Lisa: They are trained to work the front desk at the employment access center of Central City Concern. They learn about CCC services and assist people looking for help at the center or somewhere to go. They are also trained to work on the Central City Coffee business. They learn about orders, production, bagging, weighing, delivery and stocking, Accounts Payable, invoicing, customer service, and more. They also learn how to work flexibility into their schedules by working some evenings and weekends with farmers markets as well as store demos and events. 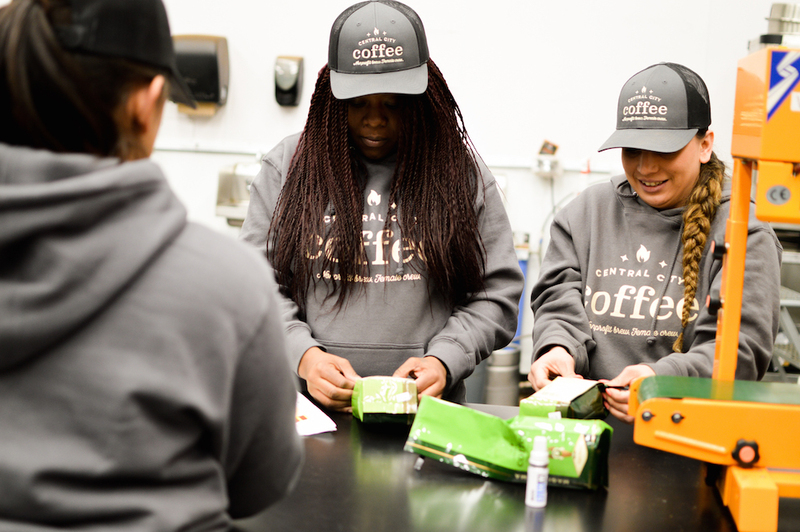 Central City Coffee trainees learn how to fold down a bag of coffee. What are your goals for Central City Coffee? Lisa: We’re always looking at where to sell more coffee, because the more we sell, the more people we can help in the program. The training program is paid for by coffee sales. We also really want to have our own retail space, and have looked into a few opportunities. We are trying to get a coffee cart going so that our trainees can apply their coffee and barista skills. We also want to look into starting to roast ourselves and getting our trainees more barista training. Tell me more about the story behind your recent rebranding and the process. Lisa: We worked with Murmur Creative on the rebranding, and we’re so happy with it. It’s all about empowered—and empowering—women! It was inspired by the vibe of moms in recovery, and the strength of these women—it’s a tribute to them. We had naming workshops to come up with the characters, who are inspired by the vibe of moms in recovery. For example, there is someone in the program with 5 kids - she’s really a ‘Magic Mama.’ One of our trainees even came up with the tagline: “Non-Profit Brew. Female Crew.” 35 people have been through program so far, and we wanted to pay tribute to those strong personas who have been a part of this. 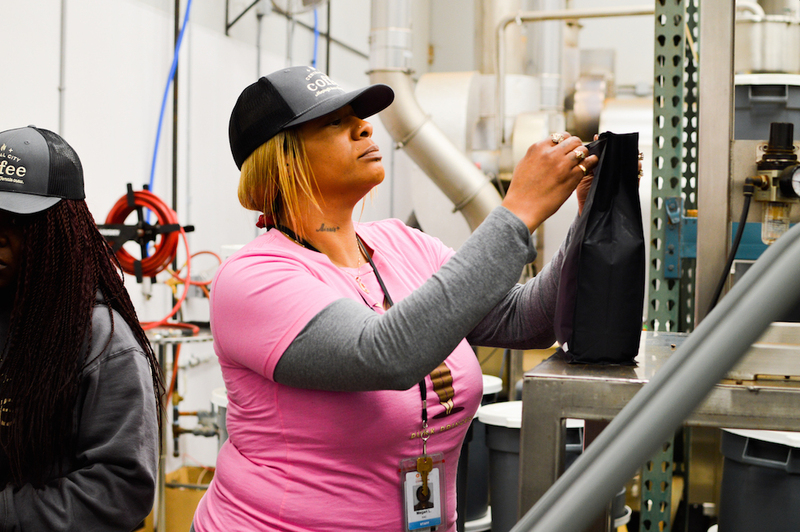 Central City Coffee’s newly-rebranded line of coffees, designed by Murmur Creative, pays tribute to the personas of strong and empowered women: Warrior Woman, Gutsy Goddess, Magic Mama, Solstice Sister, Punk Princess, and Serene Sorceress. Lisa: The reality of how our program works is that we are always hiring the least qualified people for the job. We want to sell more and more coffee, but our first mission is to train and help people. One thing that has been great is that we have been able to expand our team of permanent staff, and we now have 3 full-time people. Through the program, trainees who have been there longer also step up to train others who are newer in the program. Lisa: This is the funnest job I’ve ever had! There is a strong connection with our people, and we work well together. We support each other and understand each other because we all come from a similar place. We have created a strong peer environment and there is understanding amongst the trainees. And it’s awesome to see our trainees reach a stable point over their time in the program. Sarah: The most rewarding part for me is that we have a solid culture. We don’t have any outsiders coming in and telling us what to do. We figure it out on our own. What has your partnership with Nossa Familia been like? Central City Coffee trainees work alongside Nossa Familia Coffee production employees at the Nossa Familia roastery in Portland, Oregon. Sarah: We are really grateful for our partnership with Nossa Familia. Nossa roasts our coffee, for a fee that I think is quite a bit less than another company would normally be charged. They’re never raised the price since we started working together. We also come in to the facility and use the equipment and space for production. We use the Nossa warehouse to prep for our farmers markets, brew coffee, and store our equipment. Nossa has always been very flexible and understanding. We’ve made big asks, but they always come through. They’re also very understanding with new people. They’ve given us financial and business advice, and are always willing to help with questions. Nossa has been so easy to work with and everything has been really smooth. It’s great that we can grow together as businesses, and the cross-promotion in the cafes has also been great. If you could tell consumers one thing, what would it be? Sarah: We work hard to produce high-quality coffee and source it well. We do everything with care, and we want to tell the story of who we are. We are coffee with a purpose, and our purpose is to help women! Lisa: I found myself here. I lost myself in addiction and homelessness, but I’ve found myself in coffee. It’s so easy for people to be taken off course in life, and our program helps those people get back to their lives. You don’t really understand what people are capable of until you see it. Our program is so important for everyday accountability. I had a six-year gap in employment, and Central City Coffee help me learn how I could go back to work and life. Older PostNow Available: Gesha Coffee! But What is Gesha (previously Geisha) Coffee?